by Gil R. Rendle, Alice Mann . The Alban Institute, 2003. Much of the literature on congregational planning presents it as a technical process: the leader serves as the chief problem solver, and the goal is finding the solution to the problem. Alban Institute consultants and authors Gil Rendle and Alice Mann cast planning as a "holy conversation," a congregational discernment process about three critical questions: Who are we? What has God called us to do or be? Who is our neighbor? Many styles of discernment are explained (Ignatian, Methodist, African, and Quaker), making this approach accessible to a variety of faith traditions. 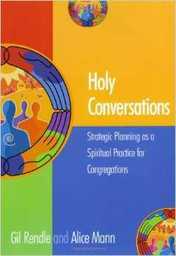 The authors describe three types of planning: “problem” planning for congregations in conflict; “developmental” planning for those needing a clearer vision and strategy; and “frame-bending” planning for those with a desire to address problems in a more radical way. The book equips congregational leaders with a broad and creative range of ideas, paths, processes, and tools for planning and includes 23 practical appendices. Congregations can choose the resources that best suit their needs and contexts to shape their own holy conversations and find a path that is faithful to their identity and purpose.